Momentarily exciting but utter nonsense, a Burmese Tiger Pit built over a gaping plot hole. 100 min. Columbia Pictures. Director: Phillip Noyce. Cast: Angelina Jolie, Liev Schreiber, Chiwetel Ejiofor, August Diehl, Andre Braugher. As you might imagine, the approach of Jolie, director Philip Noyce (Clear and Present Danger) and screenwriter Kurt Wimmer (Law Abiding Citizen) has its merits. The story of a career CIA intelligence officer informed that she’s been a Russian sleeper agent all along, Salt gives Jolie plenty of opportunities to bust out her perfected, pursed-lip “I’m about to do something naughty” look. The problem is that what may seem at first blush like an unconventional action movie has within it, waiting to break out, its own sleeper agent: a highly conventional action movie designed for franchise potential (a star is Bourne?). Suddenly on the run, Jolie’s highly-trained operative Evelyn Salt must immediately contend with two problems: eluding the full force of the CIA and tracking down her beloved husband (a German arachnologist played by August Diehl), who’s likely a victim of kidnap or worse. For the audience, there’s a larger question: whose side is Salt on? If only Noyce didn’t make it so easy to predict where Salt is going, maybe it would be harder to predict where Salt is going—so to speak. Still, the first act’s breakout of good old-fashioned Fugitive action allows for some preposterous but cool stunts of the James Bond school, and the able Jolie thrives on every such opportunity (it’s a testament to Jolie’s action-star credibility that she replaced the once-attached Tom Cruise). Salt’s ingenuity, hyper-speed reaction time and application of brute force make her a kind of Jackie Bauer who we’d better hope is working for the good guys. Jolie gets pro support from Liev Scheiber, as longtime colleague Ted, and Chiwetel Ejiofor as the skeptical Peabody (sample line: “There’s a mole in Russia House, I’m sure of it”); both are tasked with hunting down Salt, who may or may not be poised to assassinate the Russian president. This question gets answered in another novel set piece—this one set in a New York City cathedral—that’s emblematic of the movie: momentarily exciting but utter nonsense, a Burmese Tiger Pit built over a gaping plot hole. So Salt is a wild ride, crazy-ridiculous, predictable to anyone who’s ever seen a big-budget spy picture, but also pleasingly stunt-happy. Whether or not audiences will want to sign up depends on what they’re in the mood for: a gourmet meal like Inception or fast food. Add Salt to taste. 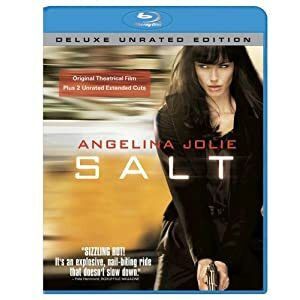 Sony's Deluxe Unrated Edition of Salt on Blu-ray turns out to have three different presentations of the film: the Theatrical Version (approximately 100 minutes), the Unrated Director's Cut (approximately 104 minutes) and the puzzlingly named Unrated Extended Cut (approximately three minutes shorter than the Director's Cut). Seamless branching brings together what's essentially a single hi-def transfer, and a fine one at that. The A/V quality is typically, for Sony, top-notch: while this isn't the most razor-sharp picture around, with the deepest blacks and finest close-up detail, the minor flaws (such as occasional soft shots) would seem to be not owed to Sony's home-video technicians but rather endemic to the director's intent and post-production treatment of the material. At any rate, only nitpickers would complain much about this handsome hi-def transfer, which has its fair share of dazzling moments. The clear, crisp, and clean lossless DTS-HD Master Audio mix adds plenty of value to the experience, handily recreating the potent theatrical soundscape, especially in the action sequences and not-forgotten prioritization of dialogue. Every bonus feature one would hope for Salt is here, starting with the Blu-ray-exclusive Spy Cam Picture-in-Picture experience (Theatrical Version only). Every participant in the featurettes listed below turns up in this track, which is a bit spotty. Only the most die-hard fans of the film and its stars will want to tough this out. On the other hand, the commentary with director Phillip Noyce is arguably essential, with the veteran filmmaker placing the film in the context of his long career and familial connection to the world of espionage; for movie buffs, Noyce may not quite be the top man working, but he makes good company on this commentary track. "The Ultimate Female Action Hero" (8:05, HD) focuses on star Angelina Jolie. Amid behind-the-scenes footage, Jolie comments, as do Noyce, producer Lorenzo di Bonaventura, Liev Schreiber, second unit director/stunt coordinator Simon Crane, producer Sunil Perkash, and costume designer Sarah Edwards. Blu-exclusive "The Real Agents" (12:33, HD) sits down for intriguing chats with three former operatives: former Major General in the 1st chief directorate of the KGB Oleg Kalugin, former CIA intelligence officer Melissa Boyle Mahle, and former CIA senior operations officer Peter Earnest. "Spy Disguise: The Looks of Evelyn Salt" (5:26, HD) delivers on its promise by interviewing Jolie, Edwards, hair stylist Colin G. Jamison, and prosthetic makeup designer Kazuhiro Tsuji. Blu-exclusive "The Modern Master of the Political Thriller: Phillip Noyce" (9:15, HD) talks with Noyce, Chiwetel Ejiofor, Bonaventura, Perkash, Schreiber, Jolie, production designer Scott Chambliss, Crane, and Edwards. Blu-exclusive "False Identity: Creating a New Reality" (7:14, HD) is the requisite special-effects featurette, with visual effects supervisor Robert Grasmere narrating footage at various stages of development. As per Sony's wont, the disc buries the lead, with the most thorough making-of featurette deep on the bench. The Blu-exclusive "Salt: Declassified" (29:47, HD) features Noyce, Bonaventura, Schreiber, August Diehl, Earnest, Kalugin, Mahle, former Secretary of Homeland Security Tom Ridge (! ), former director of communications for Homeland Security Kirk Whitworth, Jamison, Tsuji, Ejiofor, Chambliss, Crane, Grasmere, and composer James Newton Howard. "The Treatment Radio Interview with Phillip Noyce" (27:12, HD) finds host and film critic Elvis Mitchell amiably chatting with the director. It's an unusually in-depth bonus that nitty-gritty film fans will find most welcome. Lastly, the disc is, of course, BD-Live enabled with movieIQ + sync and more. All site content © 2000-2019 Peter Canavese. Page generated at 04/20/2019 01:55:08PM.